On November 19 the Naha Police apprehended a 21-year-old lance corporal of the U.S. Marines who was operating a two-ton military truck while under the influence of alcohol. This Camp Kinser-based Marine collided the military vehicle with a small truck and killed its driver, a 61-year-old male company employee from Naha City. The Naha Police arrested the Marine on charges of negligent driving resulting in death and driving under the influence of alcohol. According to the Naha Police the Marine has confessed to the charges. His blood-alcohol content (BAC) was detected by a breath test to be approximately triple the legal limit in Japan, which is 0.15 milligrams per liter (or about 0.03 percent BAC), setting his BAC somewhere around 0.09 percent. The Naha Police will continue to investigate, with the prospect of changing the Marine’s charge to dangerous driving causing death. The offense for which the Marine was arrested took place around 5:25 a.m. on November 19. 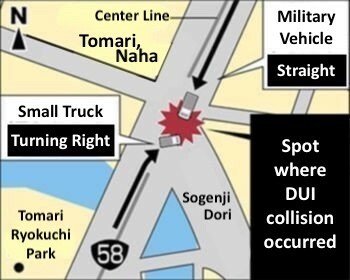 As the Marine was heading south going straight on National Route 58 in Tomari, Naha City, he collided with the small truck and its driver taking a right turn heading from Matsuyama toward Asato, Naha City. The man who had been driving the small truck is suspected to have died of traumatic chest　injuries. He was taken away in an ambulance, but died at 6:55 a.m. the same morning. The suspect also suffered an abrasion to the left side of his lower back. Through eyewitness testimony it seems that the small truck’s driver was making a right turn when the Marine ignored the red light, entered the intersection, and collided with the other vehicle. Okinawa Prefectural Police received unofficial communication from the U.S. military after the accident. According to the Naha Police it is possible that the suspect was operating the military vehicle without permission. Since Okinawan police arrested the suspect, under the U.S.-Japan SOFA he is not to be extradited. As a safety precaution the Naha Police transported the military vehicle from the collision site to the Naha Police Station. After noon on November 19 the U.S. military recovered the vehicle, as it is property of the U.S. military. 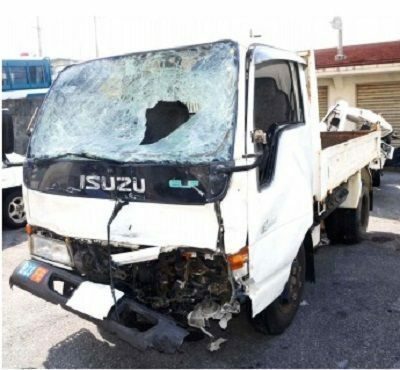 According to the Naha Police the on-the-spot and initial investigations have been concluded, so the removal of the military vehicle will not be a significant hindrance to their ongoing investigations.